Luvos Healing Earth has been a core element in a variety of naturopathic remedies for more than 100 years. The wealth of experience gained in this time is the basis of Luvos Natural Cosmetics products with their deep penetrating and harmonizing effect. The valuable minerals and trace elements contained in the Healing Earth are enriched with selected cosmetic substances and natural active agents of botanical origin to prepare ﬁnely balanced compositions for face, body, hair and wellness treatments. Luvos makes the highest demands on its natural cosmetic products and uses only natural raw materials, extracts and essential oils of high quality that are either produced in controlled biological cultivation or collected in the wild. 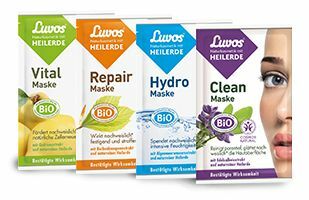 Luvos natural cosmetics offer you unique skin care products, which will revive all your senses and deserve your conﬁdence. Luvos natural cosmetics with healing earth are prepared in accordance with the strict BDIH guidelines for controlled natural cosmetics and have been dermatologically tested. They contain no synthetic colorants or perfumes. Luvos natural cosmetics with Healing Earth create an individual care experience - for your beauty and well-being at the same time. The focus is on you and the needs of your skin and hair. For every day, as an intensive care or wellness cure. For beautiful and healthy skin. Luvos' clinically-dermatologically-tested medical skin care is specially formulated to meet the needs of very dry, irritated and flaky skin and is ideal for the treatment of atopic dermatitis. For beautiful and healthy skin. Noble salvia extract in the Clean Mask, quince extract in the Vital Mask, algea seawater extract in the Hydro Mask and beech bud extract in the Repair Mask.